Here’s a Gigabyte GTX 970 G1 review and I must say that this is one future-proof card that you just cannot ignore. The amount of power that is inside of this card is capable of running basically anything at a 2560 x 1440 resolution. 1440p looks great and you will be ensured that this card will handle it once you see the power of it for yourself. If you’re playing on a lower resolution then this would still be an excellent card to have. This card has just the right amount of power needed for a great resolution and to get the full effect of what it can do it’s just best to see it in action in the most optimal way, which is 1440p resolution. 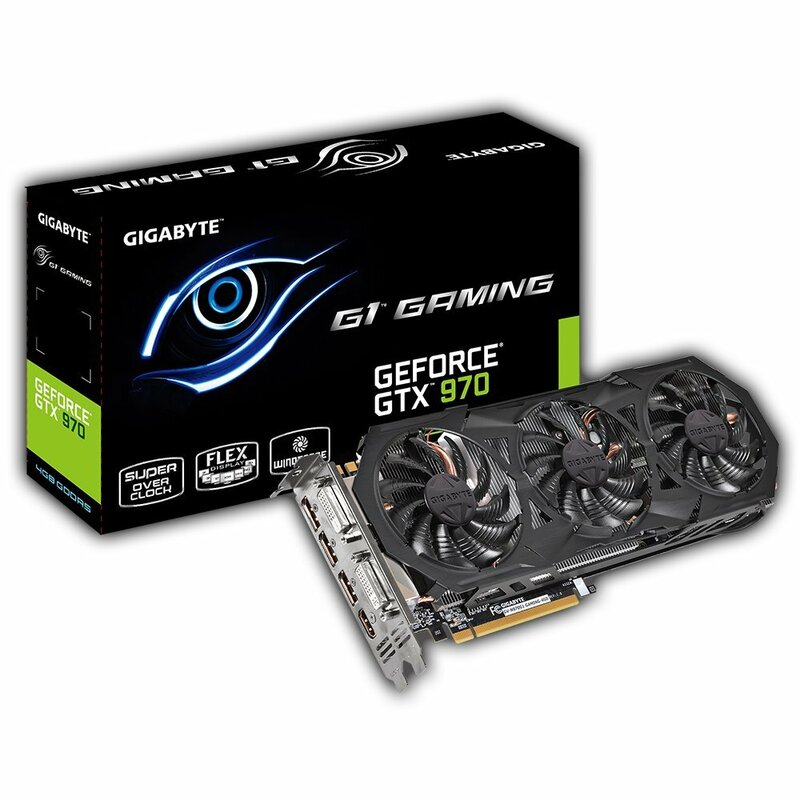 This card is a special edition of NVIDIA’s high-end GeForce GTX 970 series created by Gigabyte. It features new cooling capabilities and it also has a great feature of being able to overclock right out of the box. It has a core speed of about 1178 MHz and a boost clock of 1329 MHz. This, combined with 4096 MB of video memory, makes this card one of the best on the market right now. If you’re looking to play games such as Grand Theft Auto V, Evolve, Dying Light and The Witcher 3 on maximum graphic settings while still maintaining a great frame rate then this would be a great card for your build. Also, if you’re interested at all in dipping into virtual reality then this card will be able to handle the demands of VR for a while. Although the actual specs of what VR is going to need isn’t fully released yet so this is just an educated guess. This card has great performance and will be able to display some of the most graphic intensive things. The Intel core i7-4770k is the best CPU match for this card. If you have something like an i5-4690k or a level or two below it then you will still have enough CPU power to match the card. You’ll probably start to bottleneck the card around the i3 level of Intel’s CPUs. This card has a memory bandwidth of 224.4GB/sec. Memory bandwidth is one of the most important aspects of a video card. The higher the number dictates that the card will be able to perform better at higher resolutions. This also helps with more advanced graphics techniques such as MSAA. This GTX 970 also has 1664 shader processing units. The amount of shader processing units combined with their power dictates the overall performance of the card. 1664 units in one card is pretty great and shading will not be an issue at all with this card. NVIDIA’s GeForce GTX 970 has a technology of 28nm. The technology plays a big role for overall power consumption and dissipated heat. The lower it is, the lower they are. This card also has 1792KB of L2 cache. L2 cache is really starting to play a big part in graphics cards today. L2 cache reduces the amount of requests a GPU has to make to its memory controller. If you’re looking for the most bang for your buck in a high quality graphics card then this is definitely the card for you. NVIDIA is doing great with PC optimization as far as gaming goes and they are evolving their concepts of graphics power to be a step ahead before the next generation of PC gaming emerges. So what do you guys think of my Gigabyte GTX 970 G1 review? Do you agree that this is a top tier card? Tagged geforce, gigabyte gtx 970 g1, gtx 970, nvidia. Bookmark the permalink. Great information – was thinking about building my own computer soon – these pre-made models from the factory aren’t cutting it since my gaming switch from Xbox to computer. Thanks I will put this site to work! Any build listed here on my site will give you an amazing PC gaming experience Jordan, the pre-made models are priced about double of what they should actually be priced at! Thanks for your comment! Indeed Andy GeForce/NVIDIA is definitely a great brand for graphics cards, compatible with a lot and their drivers come out very quickly! Geforce has always had the best updates/drivers for all of the newest games. I sure wish AMD would work harder on better optimizing their hardware because I love AMD products but Nvidia with Geforce seems to always be on top of it!